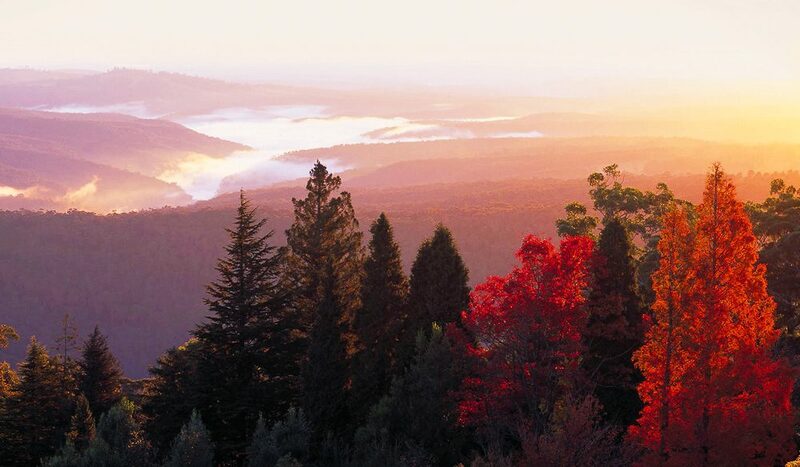 Sydneysiders have long escaped to the Blue Mountains for a weekend dose of country air. But while most travellers take the well-trodden Great Western Highway route, it is the Bells Line of Road to the north, linking Richmond to Lithgow, that’s the quiet achiever. Taking in Bilpin farm gates, hidden antique stores, and dramatic vistas across Mount Tomah, this pretty little stretch is one idyllic getaway, just a Sunday drive from the city, writes Alissa Jenkins. So what’s it known for? According to state history records, Bells Line of Road was marked out in 1823 by explorer Archibald Bell who, with the help of Aboriginal guides, forged this as an alternate route to the one made famous by Blaxland, Lawson and Wentworth (now the asphalted Great Western Highway). Today this scenic thoroughfare between Sydney and the central west, sandwiched between Wollemi National Park and Blue Mountains National Park, is best known for its fertile farmland and mild weather, which combined produce all manner of apples (and apple-based treats) around Bilpin and Berambing. Beyond the orchards is also a blend of bushland and sandstone cliffs, making way for a picturesque network of bush walks, but more on that later. 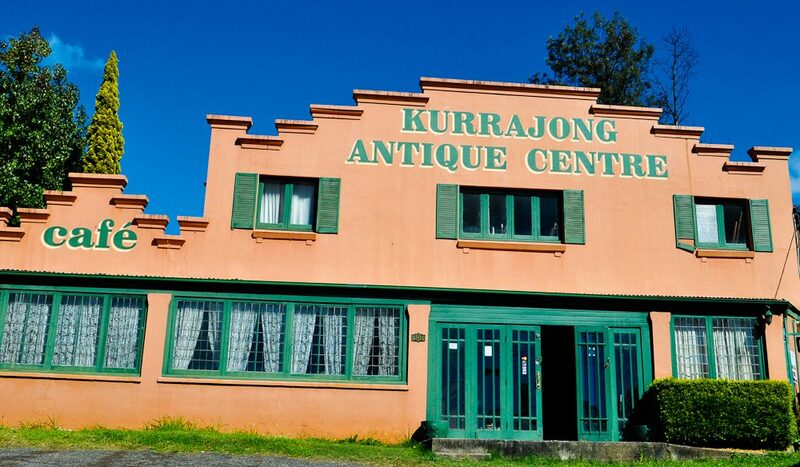 Kurrajong’s boutiques and antique stores are a must-browse. And where is it, exactly? The heart of the Bells Line of Road, Bilpin, is about 100 kilometres north-west from Sydney, meaning an hour-and-a-half drive from the airport. You’ll know you’re heading in the right direction because the closer you get, the prettier the roads (they become more winding and leafy), while quaint farmhouses emerge, and it gets more and more difficult to resist pulling over, leaning over the fence of a roadside orchard and pinching a shiny new Pink Lady. This little line of road may seem far removed from the glitz of Hollywood, but Bells recently lit up silver screens around the world as the film set for Baz Luhrmann’s Great Gatsby adaptation. Although the story is set in a fictional seaside village just outside of New York, filming took place around Mount Wilson, just beyond the halfway point of Bells Line of Road. Look closely and you can recognise the area’s tree-lined avenues, basalt walling and pretty winding roads in the film, most memorably in the vintage car chase scenes. Still, don’t be fooled by the fresh air and warm, country hospitality here – there’s city-standard food to be found in this little apple-making mecca. Inside the comfy Farm Panaroma, Bilpin, Blue Mountains. With a bounty of locally-grown goodies, it’d be remiss not to take advantage of the Bells Line produce on offer. Every couple of hundred metres between Bilpin and Berambing you’ll find hand-painted road signs advertising, among other things, fresh apples and local honey. Among the many signalled pitstops is The Local Harvest. 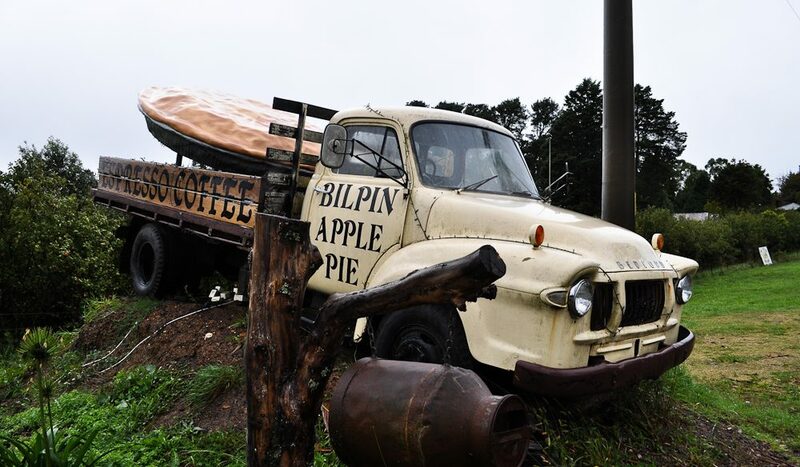 Housed in a corrugated shed, it stocks its fair share of local Granny Smiths, jams, juices (locally processed and bottled, too), as well as the best apple pies in town – you’ll need to get in early for those, though, because they sell quickly. Similarly, apples at roadside Shelley’s Shop are grown just a couple of kilometres away, and Shelley herself will proudly show you her largest fruit of the season – often around three times the size of your average specimen. There are plenty of places where you can pick your own fruit too, such as Pine Crest Orchard and Bilpin Springs Orchard – popular for teaching tiny travellers that fruit comes from trees, not supermarket shelves. Of course it’s not all Fujis and Pink Ladies – at many local farm gates you can also pick up buckets of walnuts, chestnuts, mandarins, artichokes, persimmons, peaches, strawberries and blueberries, depending what time of year you visit. If you’re in the area on a Saturday morning, pay a visit to the weekly Bilpin Farmer’s Market at the District Hall, if only for half-an-hour. Here you can find all manner of homemade jams and relishes with fabric-topped lids, to pot plants to bamboo serving spoons. As one cutely-cardiganed local assured us while handing over a banana and walnut muffin, “it’s full of goodness”. Bless. Almost as wholesome as picking fresh apples and grandma’s baked goods is a leisurely bush walk to work off those fruit pies. And there are plenty of leafy walking tracks to do just that – most popular is strolling through the Blue Mountains Botanic Garden at Mount Tomah. This pretty, cool-climate oasis sprawls across some 250 hectares atop the mountain summit, and houses more than 40,000 native, exotic and rare plants – almost as impressive as the panoramic vistas in the background. Also popular is the 30-minute walk through the Cathedral of Ferns on Mt Wilson – it’s especially beautiful in the mist. For a lengthier walk, head further towards Mount Irvine for the Boronia Point Walk, which follows a fire trail along a ridge to a spectacular lookout over Wollangambe crater – it takes about an hour-and-a-half to complete. Bells’ other secret talent is its array of antiques and boutiques around Kurrajong Heights. Among the best is Kurrajong Antique Centre which, if you take the time to sift through, is a dusty warehouse hiding some rare gems from antique Murano glassware, Australian cedar dining tables dating back to the 1820s, to a cast iron figure of former prime minister, Sir George Reid – apparently an exact replica appears in Canberra’s National Portrait Gallery. Also worth a visit is Village Emporium, with a collection of antique furniture, perfume bottles, jewellery and ornaments. Unsurprisingly, no matter where you eat along Bells, you can expect a menu sprinkled with local ingredients. At the top of the culinary hierarchy is Lochiel House – a quaint little cottage on the outskirts of Kurrajong Heights. Built by a former convict in 1825, the cottage has endured several lives as a family home, post office and art gallery, and is now an award-winning restaurant. Still with its original fireplace (a necessity for those chilly Blue Mountains nights) and an organic garden out the back, the menu centres around hearty European fare (try the nose-to-tail pork) and seasonal produce. Or ‘book a chook’ for a traditional Sunday afternoon roast, made from an organic, free-range Burrawong chicken with all the trimmings. For more casual eats, Sassafras Creek in nearby Kurrajong Village triples as a café, gallery and florist, overlooking the Sydney Basin. Matching its modern Australian menu is a boutique wine list from the Central Tablelands over the mountains. However it’s Apple Bar in Bilpin that’s the local favourite. This boutique watering hole has all the country pub requisites – chilled-out vibe, sprawling verandahs (with views of surrounding orchards), and a menu that’s not only damn tasty, but has had its fair share of mentions in the Sydney Morning Herald Good Food Guide. We’d tell you to try the Shields Orchard Bilpin Sebago crispy potato pieces with sour cream and house-made sweet chilli, or the wood-grilled kangaroo fillet with Chinese chilli plum glaze, but Apple Bar’s focus on local goodies means the menu changes almost daily. You also must save room for dessert at Tutti Fruitti, also in Bilpin. Never mind the homemade quiches and Devonshire teas here, as sweet as they are, it’s the real-fruit ice-cream that’s the big winner, using – you guessed it – local fruit. And as if this place could be any more adorable, on the same property as the Tutti Fruitti orchard is a rose farm, so you can pick up a bouquet too. Bells Line is cider country, making use of the area’s superfluous apples. Among the local producers is Bilpin Cider Co., using local Pink Lady and Granny Smith apples, as well as a popular pear range too. They’re also in the midst of turning the property’s former packing shed into a new cidery and restaurant (due to open by the end of this year). When finished, guests will be able to tour the cidery that will produce special-edition ciders, made exclusively for the on-site restaurant. Alternatively many venues (including Lochiel House, Sassafras Creek and Apple Bar), now stock Hillbilly Cider. 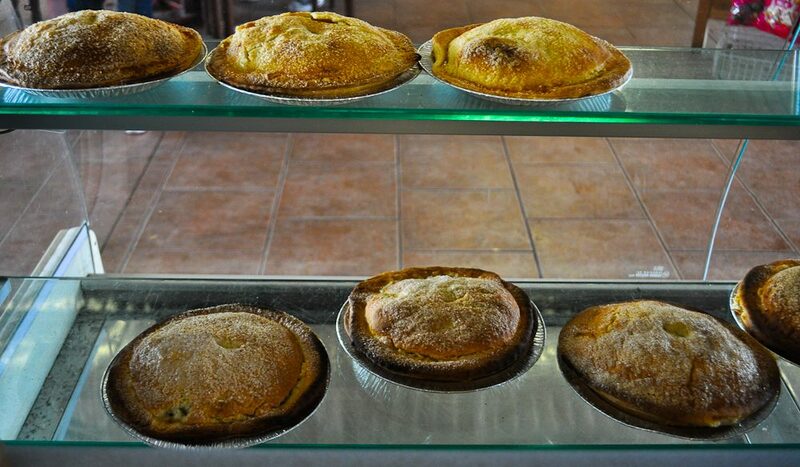 Again it’s made using all local fruit, and without any added sugar, gluten or artificial flavours, in order to keep it as close to the real deal as possible. Oh, and it tastes delicious. Joy of joys – there are plenty of great spots to stay along Bells, which not only cater for a range of travellers but several different budgets. Wollemi Wilderness Retreat (from $270 per night) is not only well-located between several towns, but lends itself to that middle-of-nowhere feeling – each of the timber and sandstone cabins is tucked away in private bushland (or sleep in the ‘Love Tee Pee’ – basic, but cute). If you’re looking for somewhere a bit more sophisticated (but cosy), we’re especially fond of Farm Panaroma (from $350 per night including breakfast; yes, the spelling of ‘Panaroma’ is deliberate). 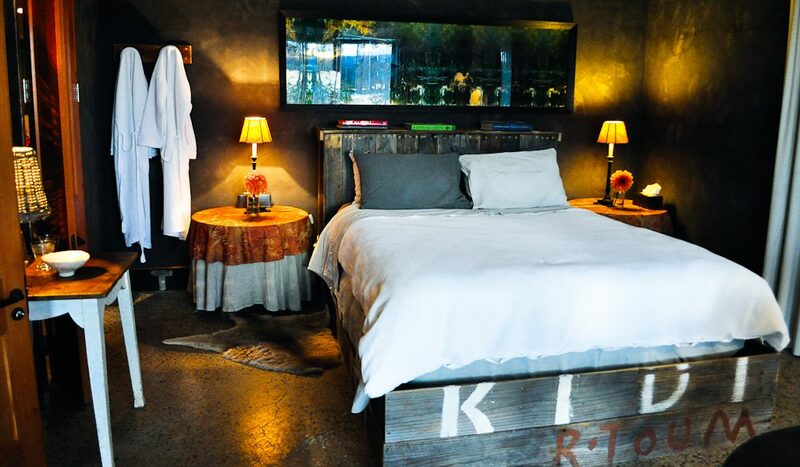 Run by Sean Moran and Michael Robertson, the same culinary power couple behind hatted Bondi institution Sean’s Panaroma, this farm stay is set on 50 acres overlooking apple trees, free-range chooks and spring-fed dams, while the interior is a stylish combination of polished-concrete floors and plush finishes. Continuing the local produce theme, much of the food here – cooked by Mr Moran himself – comes from the property, which boasts an impressive fruit, herb and vegetable garden, as well as resident chickens, geese, goats, sheep and saddleback pigs. If you’d rather not stare dinner in the eye, Ghost Hill Road Retreat (from $550 for two nights mid-week) is one of those ultimate snuggle-up destinations to just catch your breath. Set on 20 acres on the edge of Blue Mountains National Park, each of the two guest cottages comes with a king-sized bed, spa bath and log fire. Owner Brenda McCartney runs daily tailor-made yoga classes, spa therapies and guided mountain walks for guests, as well as an optional organic ‘power cleansing’ menu for those who want to take their weekend rejuvenation one step further. But as Brenda says, “I also have many guests who come here, order a room-service dinner, and sleep the weekend away. They’re just so exhausted from their busy city lives, they come here to just… rest”. Ah, we’re unwinding already. Finally, for a hugely indulgent Bells experience, Mending Wall (from $850 per night) on Mount Irvine is hard to trump. Sleeping up to eight guests, this designer holiday house comes with all the trimmings you might expect – flat-screen TV, gourmet kitchen, outdoor dining area – and then some. Expect champagne on arrival, Aveda toiletries, a mezzanine reading library and a baby grand piano… just remember to invite someone who can play it. Great post! 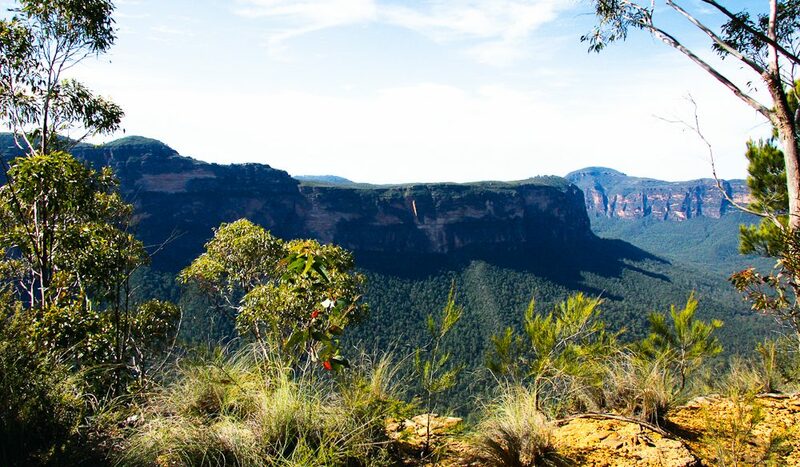 It’s refreshing to get a different perspective and a new route to discover the blue mountains. Went there back in December for the first time and can’t wait to go back and re-discover it all – with this new route in hand! Thanks. Thank you for a wonderful article on the Bell’s Line of Road, you might say a hidden secret from many who opt for the faster route on the other side of the Blue Mountains. The Bell’s Line is a prettier and more laid back route and is well known to my ancestors. My grandmother was born in Lochiel House on Kurrajong Heights in 1888 where my great grandfather was the postmaster for many years and where he died in 1922. Thank you for including Mt Wilson & Mt Irvine in the article as so many do not venture off the main road to explore these amazing and wonderful villages. I encourage anyone reading this to explore the community website at http://www.mtwilson.com.au – why not visit the Mt Wilson & Mt Irvine Photography and Art Exhibition on the 18th and 19th October 2014 to explore further the gardens and natural bushland the area has to offer.